A do-ahead spread means having time for guests and family. Spring into action early for a simply creative brunch. With a shell of chocolate frosting to decorate, an Easter egg cake can be a project that keeps youngsters involved. Sunday brunch is always special and all the more so on Easter, when the meal is likely to draw extended family and friends. The key to a successful holiday meal is to plan ahead and do as much of the preparation as possible the night before, or even a couple of days ahead. It will save time for final preparations and presentation of the meal after church or post-promenade. Go over your menu and break down tasks with an eye to what can be done ahead (such as preparing sauces or baking items from casseroles toand cakes) and what should be done at the table or just before serving (such as combining a food and sauce). The tips and recipes that follow were gleaned from local pastry chefs Angela Tustin at Plate restaurant in Ardmore, Amy Beth Edelman at the Night Kitchen Bakery in Chestnut Hill, and other noted chefs. 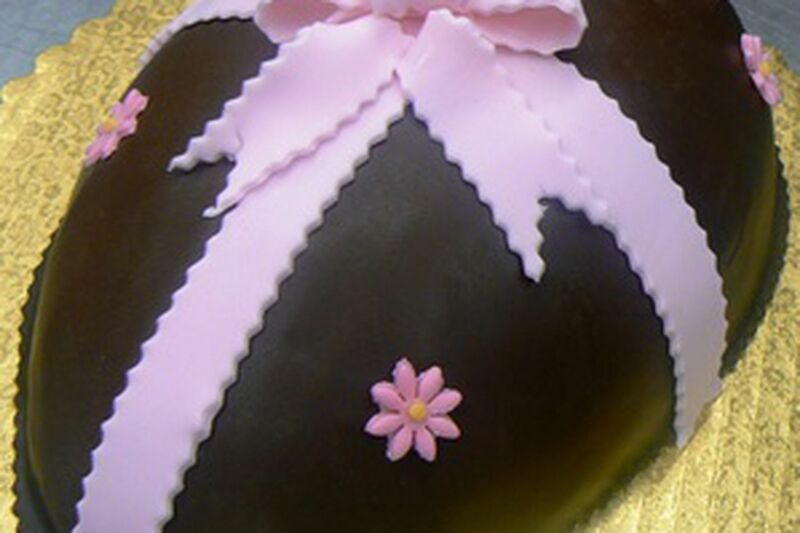 Edelman shared her recipe for a pound cake in the form of a decorated Easter egg, a specialty item at her shops. The decoration of a chocolate-frosted "egg" can be a family project that keeps youngsters interested and involved. And the cake is a fine holiday dessert for brunch or dinner. In between, there are many menu options, but the easiest are apt to be family-size baked egg dishes - a frittata or tortilla in the trendy Spanish style with potatoes, onions and cheese is a popular variation on that theme (a recipe follows). It can be served hot, cold or at room temperature. Bake sweet breads or coffee cake days ahead. Cool thoroughly, wrap airtight, refrigerate or freeze (if made more than two days ahead). Sauces and dressings can be made up to four days ahead, refrigerated, then gently reheated or refreshed with a brisk whisking just before serving. Steam or blanch vegetables for a platter of crunchy crudites to be whisked from refrigerator to table when guests gather. Assemble a casserole that can be popped in the oven when you leave for church and timed for your return. Mix a pitcher of crepe, pancake, waffle or other batter to pour onto a griddle or into muffin cups for quick morning baking. Perhaps most important, set the table, including serving platters and utensils. Use sticky notes or tape labels to show what foods they will hold. For large gatherings, dress up the event and speed cleanup by using designer disposables such as the colorful and chic coordinated paper goods featured in today's Market Basket on F3. Refresh and reheat prepared foods. Team foods with the appropriate sauce, dressing or dip, also prepared ahead, or serve them as sides at the table. Then sit back and enjoy the day. 1. Preheat oven to 350 degrees. Coat an 8-by-101/2-inch Easter egg cake pan with nonstick baking spray. 2. For the cake, mix the milk, eggs and vanilla; set aside. 3. In a large mixer bowl, stir the flour, sugar, baking powder and salt together. Add the butter and half of the egg mixture. Beat for 1 minute, scraping down the bowl. Add the remaining egg mixture, blend and pour the batter into the prepared pan. 4. Bake at 350 until cake pulls slightly from the pan or a tester inserted in the center comes out clean, about 50 minutes. Cool the cake completely (preferably overnight). 5. Transfer the cake to a serving plate or to a cardboard form cut 1 inch larger than the cake base and covered with foil. If desired, slice the cake horizontally to form two layers. Use about half of the chocolate icing as filling between the layers. Use the remaining icing to coat the surface of the cake. 6. Decorate the cake for Easter, as desired, applying piped colored icings, rolled paste, marzipan or sculpted designs. 7. For the Chocolate Icing, beat the butter and sugar together at medium mixer speed until smooth. Add the cocoa, vanilla and milk and beat until smooth, scraping down the bowl. Use icing at once, refrigerate for up to one week or freeze. 756 calories, 5.6 grams protein, 67 grams carbohydrates, 48 grams sugar, 55 grams fat, 201 milligrams cholesterol, 121 milligrams sodium, 3.2 grams dietary fiber. Contact food writer Marilynn Marter at mmarter@phillynews.com or 215-854-5743. The Night Kitchen Bakery has shops at 7725 Germantown Ave., Chestnut Hill (215-248-9235) and 45 East State St., Doylestown (215-348-9775). For Plate Restaurant, 104 Coulter Ave., Ardmore, call 610-642-5900. For more area restaurants offering Easter Sunday brunch, visit www.gayot.com/holiday/easter/philadelphia.html.